Get thirty-three lessons of short daily dialog between a new student from the USA and a student from the UAE. - Including explanations and Grammar notes. The bilingual Arabic-English section of each lesson offers basic grammatical analysis and recalls needed details already discussed in Levels 1 to 3 of the program. The Arabic section of the screen consists of interactive color-coded lines for each dialog. 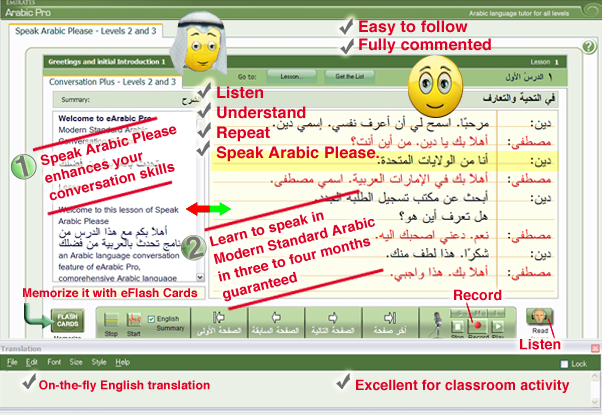 After studying the text and the explanation in the bilingual section, the student can either click on each line of the Arabic text individually to listen to the sentence, or click on the "Read for me" icon button and listen to the conversation. A localized on-screen overlay "Help" is also available on the "Flash Cards" and the "Main Interface" pages. You can use the Auto Blend or the Manual Blend Level control to see the exact functionality of each part of the screen.